Are you looking for a way to decrease expenses to free up capital for growth? It can be tough to decide between labor costs or outsourcing costs. On one hand, you can control and manage the labor, and on the other hand, you have to trust the outsourced manufacturing or fabrication is taken care of appropriately. But that’s why you went into business. You want to make an impact on the world and get paid to do it. Decisions like these aren’t something you learn through traditional education. You have to do them on your own, learning as you go. At United Global Sourcing, we understand if you’re contemplating the idea of outsourcing manufacturing to focus more on your core competency or to simply free up some cash flow to grow your business. Our advice? Outsource. It will save you time and money, offering a peace of mind you’ve not known since you’ve gone into business. In this post, we share the top pros and cons to outsourcing manufacturing and fabrication. We want you to know exactly what you’re getting into when you decide to outsource. What’s more, United Global Sourcing is here to help you make the most out of outsourcing. We rely on our expert communication to serve you and your company’s needs. Contact us today to learn more. Otherwise, read this post to gain some insight into outsourcing. Although this is a con, it’s not as large of an issue as most think. You do rely on another factory to produce, fabricate, or fulfill your products; however, you need not worry about lack of control. Sure, you may need to work with another person to determine the best route for your business partnership, but control is a phone call away. Although a con, it’s a simple one to resolve if anything were to go wrong with the process on your outsourced manufacturer’s end. Yes, outsourcing will require you to communicate more, but the upside to this minor nuisance from time to time is worth the time spent. You get to focus on your competencies and work on your business instead of in it, managing manufacturing and fabrication you could already outsource. It can take time to find the best quality outsourced manufacturing factory; however, once you do find it, you can scale as fast as your partnerships can keep pace. If you’ve partnered with a factory that can scale with you, or is large enough to handle your growth over time, you will be able to spend more time on quality assurance, although it does take you away from executing on your competencies. Nonetheless, if you can get this figured out, you will reap the benefits of outsourcing. The cost of an employee needs to be less than the value they can produce over lifetime employment. It can be tough to increase margins in this manner if you manufacture and fabricate in-house. That’s why outsourcing is great for margins and the bottom line. You can increase them with a small increase in expenses. You may be able to do 100 percent of the manufacturing, fabrication, and fulfillment, but how high is the quality. Could you do more of what you’re good at if you outsourced? Outsourcing manufacturing can increase the ability to pull from a larger pool of capabilities at a lower cost. This means that although you can run your own business in-house from start to finish, it may be less expensive to outsource and invest your gains back into core competencies and scaling. 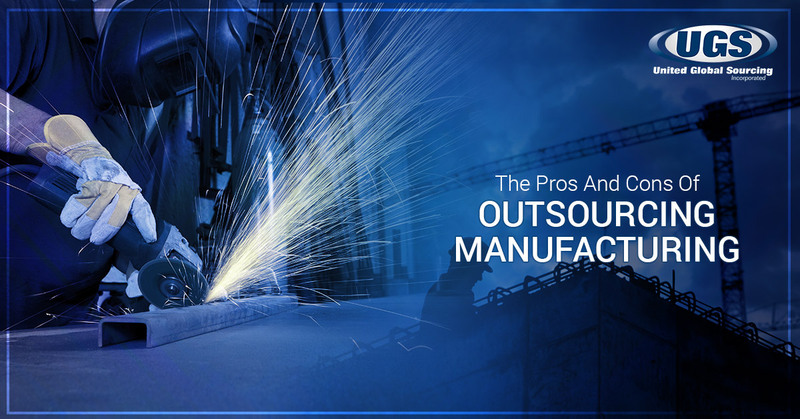 You, as well as hundreds of others, outsource their manufacturing for a variety of reasons. The biggest reason is labor cost. It can shrink margins quickly, and outsourcing is a relatively simple solution to this. Companies are able to research and find the right factories around the globe compared to local. This offers you better costs for labor and the ability to grow as fast as the demand in a market rises. What if your company is moving from in-house to outsourced? You need to be careful with your current employees, manufacturing processes, and cost swings. If you decide to outsource half of your business, what are the ramifications of that transition? What will the cost be? Prepare for employee compensation once laid off, the cost difference (which is probably why you’re considering this decision), and what it will take to get the processes you’re outsourcing functioning properly. At United Global Sourcing, quality is the bottom line. Communication is the cornerstone of our success, delivering a number of manufacturing processes and supply-chain services to fit your company’s needs. When you choose to outsource, you can trust United Global Sourcing to be there for you through the entire process. Contact us today to get started or visit our website to learn more!